There are 5 studio areas: Metal, Electronics, Wood, Craft, and Jewelry. Each area has benches and tables on which to build your projects, electrical outlets for your computer, and project storage space. There are also hundreds of hand tools and clamps and power hand tools such as sanders, drills and routers. The Conference Room is used by many local maker groups and has extension cords, tables, chairs, 3 whiteboards, and a digital projector that is both PC and Mac compatible. There is also a kitchen for you to make coffee or tea and microwave or refrigerate your dinner or lunch. When you join Maker Works, you gain access to not just a multitude of state-of-the-art tools but a creative, thriving and supportive community as well! Join today and start learning, building and collaborating immediately! 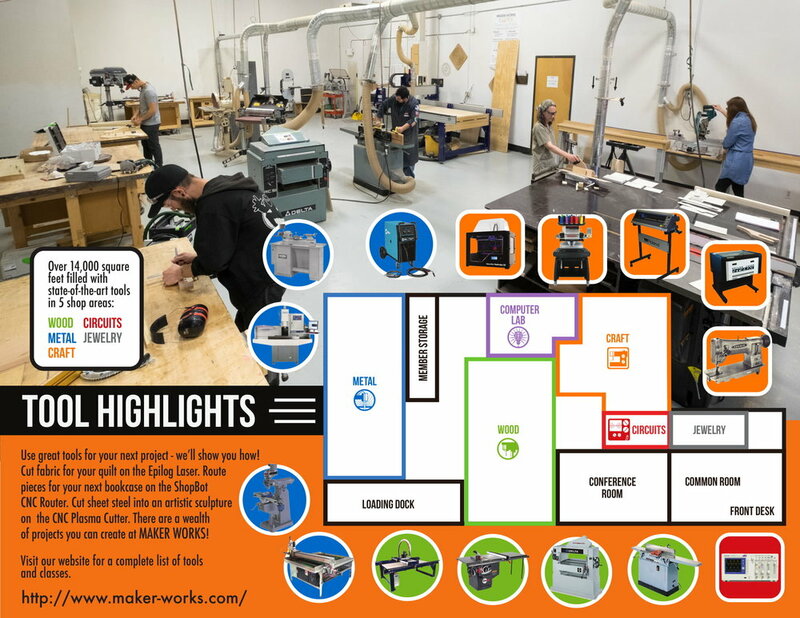 Maker Works offers several types of membership. Benefits include access to all areas and their tools, access to computers and software, free WIFI, and more! Look for the colorful dust collector! Locating Maker Works within Airport Plaza industrial park can be challenging. Most of the buildings are beige, many navigation apps give the wrong directions, and signage is limited due to zoning regulations. We’ve painted our dust collector in fun Maker Works colors to brighten your day and help you find your way! Across from Costco, turn onto Plaza Drive, take the (quick) second left, and it’s the third building on the right. The entrance is around the corner from the dust collector, on the right side of the building.